You're out in your backyard during the summer enjoying your family and grilling your dinner. Oh!! You never heard or felt it coming. You look down see a painful, swelling mosquito bite. Later, you feel another one bite you. Do these insects carry disease? What can you do to protect yourself? Chemical sensors - mosquitoes can sense carbon dioxide and lactic acid up to 100 feet (36 meters) away. Birds and mammals gives off these gases as part of breathing. Certain chemicals in sweat also can attract mosquitoes (people who don't sweat much don't get nearly as many mosquito bites). Visual sensors - if you are wearing clothing that contrasts with the background, and especially if you move while wearing that clothing, mosquitoes can see you and zero in on you. It's a good bet that anything moving is "alive", and therefore full of blood, so this is a good strategy. Heat sensors - Mosquitoes can detect heat, so they can find warm-blooded mammals and birds very easily once they get close enough. Little Fly The word "mosquito" is Spanish for "little fly," and its use dates back to about 1583 in North America (Europeans referred to mosquitoes as "gnats"). Mosquitoes belong to the order Diptera, true flies. Although mosquitoes are like flies in that they have two wings, they are quite unlike flies because their wings have scales, their legs are long and the females have a long mouth part for piercing skin (proboscis). One of the only ways to stop mosquitoes from finding you is to confuse their chemical receptors with something like pyrethrum. Head - This is where all the sensors are, along with the biting apparatus the proboscis (only females have the proboscis, for biting). The head has two compound eyes, antennae to sense chemicals and a mouth part called the palpus. Thorax - This segment is where the two wings and six legs attach. It contains the flight muscles, compound heart, some nerve cell ganglia and trachioles. Abdomen - This segment contains the excretory and digestive organs. So you have a sensor package, a motor package and a fuel processing package -- a perfect design! Aedes - These are sometimes called "floodwater" mosquitoes because flooding is important for their eggs to hatch. Aedes mosquitoes have abdomens with pointed tips. They include such species as the yellow-fever mosquito (Aedes aegypti) and the Asian tiger mosquito (Aedes albopictus). They are strong fliers, capable of travelling great distances (up to 75 miles/121 km) from their breeding sites. They persistently bite mammals (especially humans), mainly at dawn and in the early evening. Their bites are painful. Anopheles - These tend to breed in bodies of permanent fresh water. 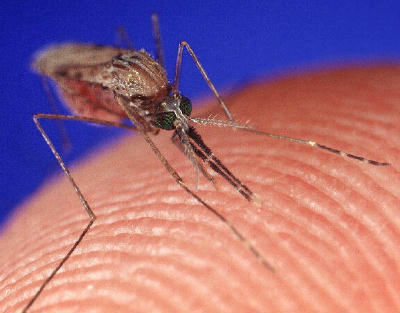 Anopheles mosquitoes also have abdomens with pointed tips. They include several species, such as the common malaria mosquito (Anopheles quadrimaculatus), that can spread malaria to humans. Culex - These tend to breed in quiet, standing water. Culex mosquitoes have abdomens with blunt tips. They include several species such as the northern house mosquito (Culex pipiens). They are weak fliers and tend to live for only a few weeks during the summer months. They persistently bite (preferring birds over humans) and attack at dawn or after dusk. Their bite is painful. Some mosquitoes, such as the cattail mosquito (Coquilettidia perturbans), are becoming more prevalent pests as humans invade their habitats.